Spot coolers are versatile and used in so many applicatins. But remember, you will always get more effective and efficient cooling if you use a portable spot cooler as a portable air conditioner. So if you can, go ahead and install that make up air duct so you have a true air conditioner. Since our spot coolers are designed for operating in office environments they operate quietly and efficiently. The temperature controls are simple and easy to understand and operate. Saving energy and pro-environment, easy to use and clean, it can be used in the room,kitchen,working shop,office,hotel,hospital,shop store,and it can be moved to any corner. 1. Enjoy fresh cooling wind as comfortable as sea breeze. 2. O3 ionizer to clean air. 3. Design with universal wheels, easy to move anywhere. 4. Environmental friendly refrigerant,save energy. 5. Big water tank, be able to remove conveniently. 6. Low noise, low weight compact design to save space. 7. LCD display, easy and clear to operate. 8. 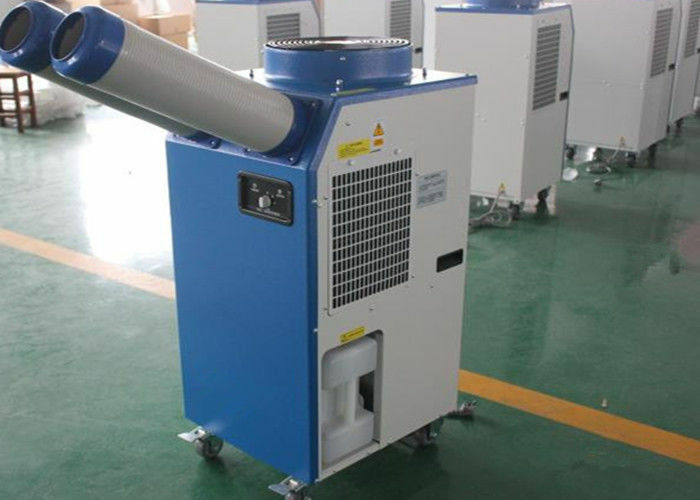 Powerful centrifugal fan to bring large air flow. 9. Design with 1--3 air out pipe, direction is adjustable. 11. Be able to connect with exhausted duct to put in outdoor.